An interesting small Italian box of great quality has just come into stock, Sarcophagus in shape and with an ebony frame and inset with panels of “Pietra Dura”, Italian “Hard Rocks” or stones. 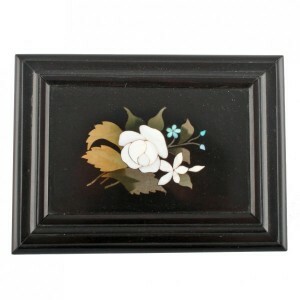 The black marble has inset cut pieces of stone in the shapes of flowers, each of the five panels in the box is different and hand made. The moulded ebony frame with a hinged lid and sitting on four turned ebony bun feet. Graham Smith Antiques has been established for 14 years but Graham has been in the antiques business for 40 years. We trade on line and from showrooms on the edge of the city of Newcastle upon Tyne, UK and all the items shown on the website are available to view at the show rooms where they are set out in four room settings – for ease of viewing. As long time members of LAPADA [the Association of Art and Antiques Dealers], the UK’s largest trade association for professional art and antiques dealers, we want all our customers to be confident to buy from us on line or in person and make every effort to make each sale a pleasure. Please take some time to read our Testimonials page which can be found on the home page of our website.